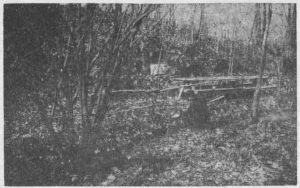 Although much has appeared in this column within the past few weeks in regard to both the mineral water und the precious stones and ores found on “Treasure Farm”, the former Morris Abner Barr property, it was not until last week that Mr. Barr made his second visit to your columnist, and told the story of how the first diamonds were discovered there. ‘Every Sunday afternoon, when the sun is shining, a man enters your property on Diamond Rock road, and follows that stream all the way up to the top on Frish road. The man carries a little bag and every time the sun comes out bright and shines down through the trees onto the stream, he picks something out of the water and puts it into the little bag. Since you own this property we feel you should know this.” There was no clue to the writer of this letter except that the envelope was postmarked Valley Forge. Thus, Mr. Barr had on his hands a mystery which he resolved to solve. Choosing the first clear Sunday after the receipt of the letter, he went a considerable way up through the woods on his property. There he found a spot which commanded a view of the full length of the stream as it ran through his land. “Sure enough,” to quote Mr. Barr himself, “in a very short time a man entered the strip of woodland and started to follow the stream. Every time the sun would come out bright from behind the clouds and shine between the leaves over the water, the man would lean over and pick something up out of the water and place it in his little bag. This he kept up all the way until he was a short distance from me. “As the bright sun came from behind a big cloud he seemed to spy something of exceptional interest. Hastily he leaned forward to reach into the water when his feet slipped and he went face forward and straight down the embankment. I made one leap for him and although my foot slipped, I still caught him by the arm before he landed in the water.” Mr. Ban found that the man was a cripple. He realized, too, that the intruder was wise enough to recognize the value of what Mr. Barr himself had not known. These were precious stones he was picking up from the bed of the stream, and this realization came to Mr. Barr the more readily, because he had already had some intimation of the possibility of such finds from Mr. Demming. And so Mr. Barr was generous enough to say to himself: “This man has a marvelous mind to recognize the value of these gems in the rough, lying there for all those ages, stained and winter worn as they are… it is now up to me to find out what they are.” Stone by stone, this man took from his bag what he had collected, telling Mr. Barr, as he did so, what each one was, as well as its approximate worth. Mr. Barr found that his strange visitor was a registered jeweler, born in a small community nearby and in business with his brother in a neighboring town. And so began a friendship which lasted many years, inopportune as its start had seemed to be. The entrance wall at “Valley Forge Springs”, shown in the picture with last weeks’ column, looks just as it did some 20 years ago, after Morris Abner Barr had completed it. To those who have been following the extraordinary story of this “Treasure Farm” during the past few weeks, it might be interesting to drive along the road that leads west from Valley Forge to Phoenixville on some of the pleasant summer days ahead. Just past the small Valley Forge Post Office building, a road turns off to the left from the main road to Phoenixville. The entrance to the Springs comes into view almost immediately. 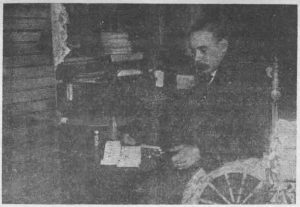 Here Frank Caughrey, Mr. Barr’s successor, still maintains the bottling works, although the main office of this still large and prosperous business is now in Norristown. For more than ten years before he actually began work on his entrance wall, Mr. Barr collected stones from his property with which to build it. 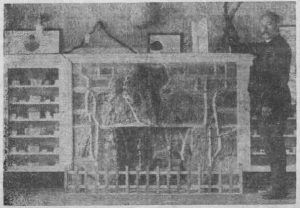 The design was entirely Mr. Barr’s own, while the work was done with the help of only one laborer, who supplied the mortar and assisted with the setting of the stones. Many watched the progress of its building, and many more came to admire it after it was completed. Among the latter was an expert Italian stone mason who specialized in this type of work. He offered Mr. Barr a steady position “to do nothing but build family entrance walls” – an offer that the latter could not accept. 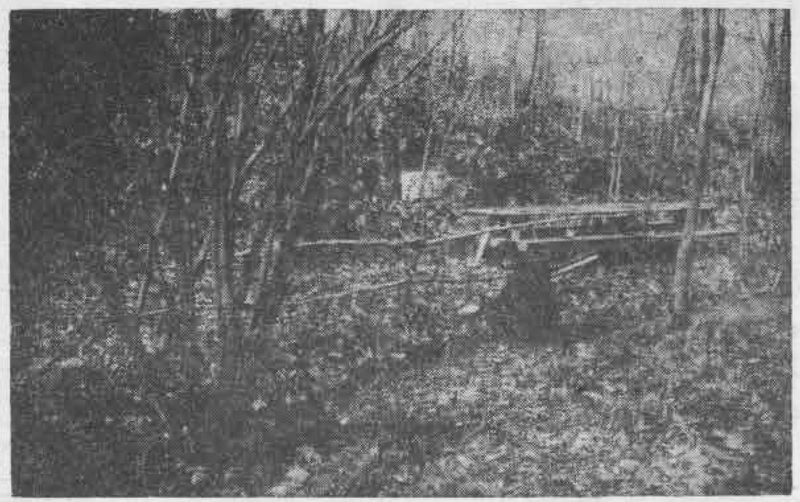 The first picture illustrating today’s column shows Mr. Barr hunting gems in the spot he had named “Shady Nook.” His great spirit of hospitality prompted him to put up long picnic tables and benches in this general vicinity for the hordes of visitors who assembled here after the story of his finds found its way into print. A number of pictures in Mr. Barr’s present collection show interested groups standing by a line-up of now out-dated automobiles, or seated at picnic tables in the vicinity. References have already been made in these articles to the great variety of precious and semi-precious stones found on the premises, especially in this “Shady Nook” vicinity. A new listing, which your columnist had not seen before, enumerates some 26 different specimens. 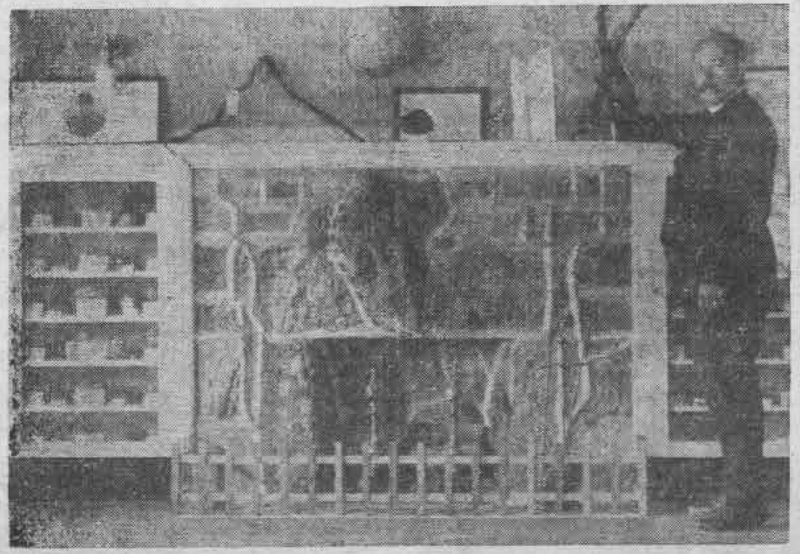 The second picture in today’s article shows parts of the interior of the much enlarged first small cottage built by Mr. Barr. The fireplace is more of his handiwork, the stones being found while he was excavating for the original cottage. It is in the center of one of the outside walls of a very large room, which has been used for various assembly purposes, including a meeting place for a nearby Scout Troop. When Morris Abner Barr came to Wayne from Royersford to visit your columnist he brought with him a number of pictures, three of which are reproduced in this week’s column. Others will appear next week. Many old timers in this section recall Mr. Barr as he appears in the first picture, when he distributed his bottled waters throughout the Philadelphia suburban area. To those among us who are accustomed only to the streamlined automobiles of the present, this picture has a very quaint look indeed. As a matter of fact, it was a bit “different” even at the time the picture was taken, since it was an old Autocar touring car converted into a truck. 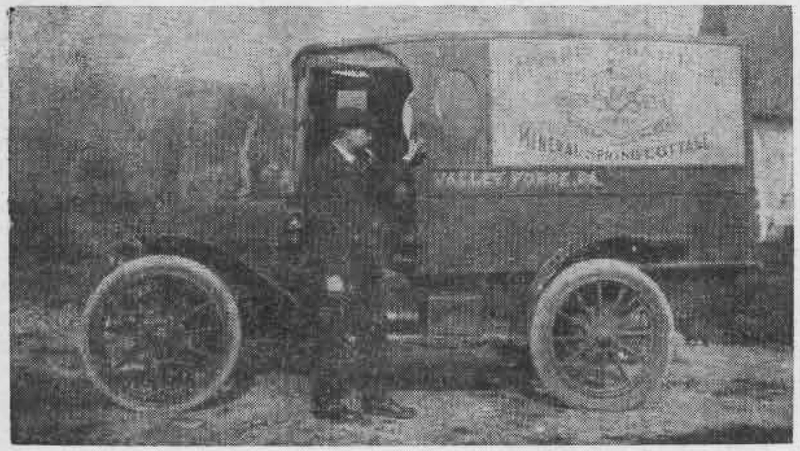 It must have been a sturdy affair, for Mr. Barr tells us that in the year 1917 alone, more than 11,000 gallons of alkaline mineral water from Valley Forge Mineral Springs were delivered from it. 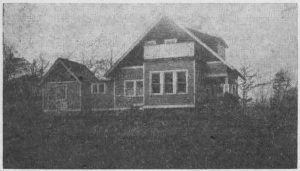 The second picture shows the first cottage built by Mr. Barr in 1914 when, as an obscure Ardmore carpenter, he had $800 to spend on the project of erecting a simple little house near historic Valley Forge. 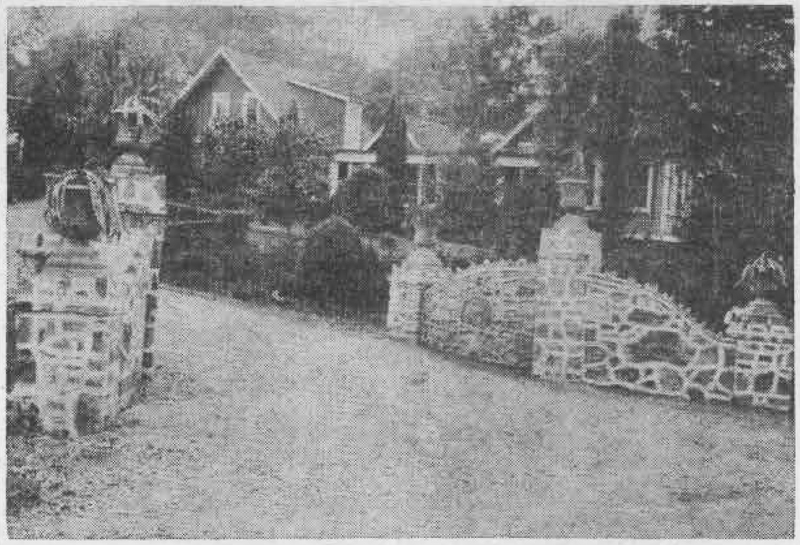 According to an article published in 1917 in the ”The Daily Republican” of Phoenixville, “the careful construction and the natural mountainous beauty of the background of the little house tucked against a huge hill, quickly found for it a tenant. That first tenant was Frank Bean, now a resident of Norristown, whose name and that of his wife will go down in history of one of the greatest natural springs in the world”. For it was Mrs. Bean who first discovered the medicinal qualities of the water which gushed from a spring in the cellar of the new house the family was occupying. In constructing the house it had been necessary for Mr. Barr to utilize this spring for the water supply, since his simple budget of $800 did not permit the piping of water all the way from Phoenixville. Two weeks after the Bean family had moved in, Mr. Barr came to finish some minor work on it. “It was this casual, unheralded visit of Morris Barr”, according to the Daily Republican, “that was the beginning of the great business now operated at these unique springs”. For on this occasion Mrs. Bean told him of the improvement in her general health even in the short time the family had lived there. This improvement she attributed entirely to her use of the water from the spring. Her husband’s neuritis had also disappeared to a great extent. Following that visit Mr. Barr began the steady use of the spring water in his own home in Ardmore. And when the neighbors heard of the remarkable water, “there was soon a steady stream of visitors to the Bean home to secure the “better than medicine water”. After all this an extensive questionnaire had to be filled out by Mr. Barr. When this was done to the satisfaction of the State Department of Health, Mr. Barr was granted permission to build his plant, including a special vault at the cost of $4,500 and the installation of a bottle washing machine for an additional $1,250, figures which would doubtless be tripled in similar work done today. The last picture shows the completed building, much as it looks today. 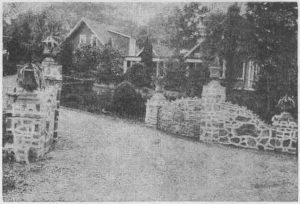 Especially interesting is the entrance wall, which was the last construction work done on the property by Mr. Barr himself. The story of the designing of this wall by Mr. Barr, and the stones that went into it, will be told in next week’s column. Since writing the previous installment of her story of “Eleven Acres of Diamonds” which appeared in “My Town and Your Town” last week, your columnist has had a personal call from Mr. Morris A. Barr, one-time owner of the land. His interests through these years have been many and varied. One of a large family of children, he knew little but hard work on a Berks County farm as he grew up. With his first hoarded earnings he bought a piano, and later on, he wrote a number of poems and songs, many of which have been set to music. On the more practical side he learned to be a carpenter and builder, and he turned his talents to several inventions, among them a “quick change machine” now in use in a number of banks. This, then, is the man who made the discoveries of ore and precious stones on his property near Valley Forge, that won for it the descriptive title, “Eleven Acres of Diamonds.” Although Pennsylvania is known as a state of natural rock and mineral resources, it is amazing that so many of them should have been found in such a small area. Perhaps the most likely explanation is that of a former State mineralogist of Colorado, who said that “the surface soil containing the gems was originally hot lava sent forth by an erupting volcano”, and that such a combination of minerals and metals is found only in a “place deposit” (the result of volcanic action). Thirty years after his startling discoveries, Mr. Barr is still being asked to give talks about his one time famous property. Only this spring, after a lecture delivered before the Rotary Club of Royersford, he found that among his audience there were three men who had heard him talk on the subject in the early 1920’s. This measure of fame is perhaps some small recompense for the fact that Mr. Barr realized little in the way of monetary gains from the sale of his numerous finds. These finds were never in large enough quantities to warrant mining, and although Mr. Barr made sales from time to time, many of the minerals and gems were given away by him as gifts to various people. Of his gift collections, one is as close as Radnor High School, another as far away as Baghdad, the Chester County Historical Society, which has made Mr. Barr a “life member”, owns a large number of his finds, among them several polished and mounted gems. George Currier, former curator at LeHigh University, who at one time gave a series of afternoon talks at Mr. Barr’s Valley Forge Museum, owned a number of the latter’s best specimens. The Delaware County Institute of Science has in its possession a good collection of minerals form the “Eleven Acres of Diamonds.” The State Museum at Harrisburg once asked Mr. Barr’s assistance in obtaining samples of fluorescent metals for their collection. Interestingly enough, this is one kind of metal never unearthed at the Valley Forge farm. Upon request from the Chester County Historical Society, Mr. Barr wrote his autobiography in 1940. Copies of this, along with those of others of his books, which have been privately printed, are in the libraries of several historical societies, as well as in a number of schools and community libraries. Mr. Barr’s store of general knowledge, much of it self-taught, has earned him membership in almost 40 societies and organizations. Among these, in addition to the Chester County Historical Society, are the Delaware County Institute of Science, the Academy of Natural Sciences of Philadelphia, the Pennsylvania Academy of Fine Arts, the National Audubon Society, the Pennsylvania State Horticultural Association and the Chester County Council, Boy Scouts of America. These and other on the long list show the diversity of Mr. Barr’s interests and activities. Interesting as were the discovery of rocks and gems on the Valley Forge property, Mr. Barr’s real business, however, lay in the widely distributed sale of medicinal waters of various kinds throughout the general area. First discovered by him in 1914, they were developed by Mr. Barr under orders of the late Dr. Samuel G. Dixon, of the Pennsylvania State Board of Health. Among the many unusual stories told in connection with the work of excavation was that of an Indian work shop which was unearthed. The vast numbers of Indian relics which were found has led to the assumption that there was once a good-sized settlement not more than 50 feet from the main stream which flows through the property. It seems quite possible that these Indians settled here because of their discovery of the medicinal quality of the various springs. According to tradition they had excellent health and lived to enjoy many long years of activity. The large museum which Mr. Barr built in his original plant contained many of the relics found thereabouts. Mr. Barr brought with him on his last week’s visit a number of pictures of the Valley Forge property as it appeared when he owned it. As it was then too late to reproduce them for use with this weeks’ article, several will illustrate next weeks’ column, which will be the concluding one in this series.